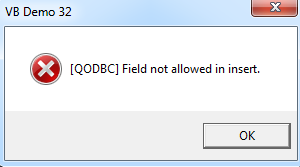 Use "OpenBalance" field instead of "Balance" field, As QuickBooks SDK does not allow to insert value in "Balance" field but uses "OpenBalance". After inserting value in "OpenBalance" field, the value is moved to "Balance" field. Note: Sample query contains dummy data Ref field are subject to change as per your company file. You can add/remove fields from the query as per your requirements.